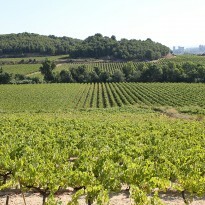 A few kilometres from Vilafranca, surrounding the hermitage from which its name is taken, is the Muntanyans estate. Rooted in the calcareous, clayey soil, different varieties of red grapes grow: Cabernet Sauvignon, Merlot, Tempranillo, and the prestigious white Chardonnay grape. The scarce rainfall of this area is made up for by its southern orientation, facing the Mediterranean, allowing the grapevines to take advantage of the summer dew, perfectly completing the growth cycle of the grapes. To further favour this perfect ripening of the grapes, all of the grapevines Bodegas Pinord own privately are trained, in order to take advantage of our most valuable treasure, the sun.